The development of industry in the Canalway began with agriculture and was fueled by waterpower provided by the canal and rivers. Distilleries and later gristmills converted farm products into finished market goods. A local county history describes whiskey as “the universal beverage used just as it came dripping from the numerous little copper-stills that were operated throughout the forest settlements.” Milling became a trademark of the region’s economy, producing not only grain, but also lumber and woolen goods. Place names such as Boston Mills testify to this heritage as does the Wilson Mill located within the Ohio and Erie Canal NHL district. The Mustill Store in Akron’s Cascade Locks Historic District houses exhibits about the Schumacher Mills in Akron, manufacturer of Quaker Oats. Stone quarrying and boat building were other canal-influenced industries in the area. At the height of Ohio’s canal era, between 1825 and 1875, Boston and Peninsula were centers for the boat building industry. Akron, along with these two communities, built hundreds of the boats used on the Ohio and Erie Canal. The 1836 Boston General Store in Cuyahoga Valley National Park (CVNP) features a canal boat building exhibit. The predominant extractive industry in the northern part of the Canalway was stone quarrying; south of the continental divide in Akron it was coal mining. Quarrying was regarded as the main industry in Peninsula and at one time its four stone quarries employed 200 men. In addition to stone blocks, quarries produced high quality grindstones. The large stepped ledges of Deep Lock Quarry, located along Riverview Road and the Towpath Trail in Peninsula, testify to the importance of this industry. The output of several coal mines in Summit and Stark counties played a significant role in the development of these areas and the evolution of Cleveland and Akron industries. Ohio and Erie Canal shipping records for the Port of Cleveland show an increase of one million tons shipped from 1837 to 1847. To facilitate coal shipments mine owners built the Messenger feeder canal in Clinton. This canal ran directly from the coal mines to the narrow area located between two locks that define the Ohio and Erie Canal Historic District in Clinton. Coal distributors in Cleveland advertised coal from “the celebrated mines of Clinton.” Today, the Towpath Trail and several wayside panels provide access to and interpretation of this district. 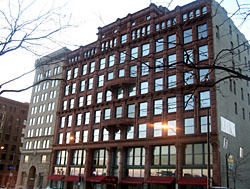 Cleveland’s Warehouse District evidences the city's late 19th-century industrial growth and the convergence of transportation options. The Ohio and Erie Canal traffic, steamship commerce on Lake Erie, and the role of Cleveland as a major Midwest railroad hub all contributed to its great commercial and industrial growth. This resulted in a concentration of warehouses, a historic district including 70 buildings and covering nearly 55 acres. This Victorian era commercial cityscape includes large warehouses for hardware distributors, marine suppliers, garment manufacturers and smaller wholesale and retail establishments for dry goods, grocers, tool suppliers, and ship handlers. Along with the smokestacks and mills came company towns and entire planned neighborhoods. The Jaite Company town in CVNP consists of several catalogue houses across from a Cuyahoga River paper plant. Barberton is a city laid out in its entirety by O.C. 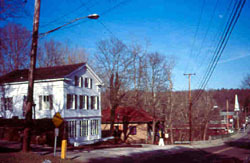 Barber as a manufacturing district and home to his own Diamond Match Company. The Diamond Match Company, once covered two city blocks and produced well over a hundred million matches a day. Barber’s Anna Dean Farm was a large scale experimental farm on the outskirts of Barberton. Some of the original large brick and art stone farm buildings remain as the Anna Dean Farm Historic District. 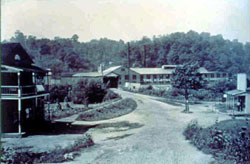 Early 20th-century industrial development in the Canalway included Akron’s development as a world leader in rubber manufacturing. Charles Goodyear's invention of vulcanize rubber generated a vast new market with the mass production of bicycles and the horseless carriage in the 1890s. Rubber factories, including Goodyear -- named in honor of Charles Goodyear--soon sprawled across Summit County and by 1920 Akron’s 22 establishments producing rubber tires, tubes and other goods employed 77,000 workers – 85% of the city’s labor force. The National Historic Landmark Goodyear Airdock and the Ace Rubber and Swinehart rubber plants in the Cascade Locks Historic District evidence this industrial heritage. 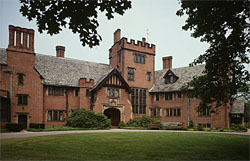 The wealth created by this industry is reflected in Goodyear founder and CEO Frank Seiberling’s majestic estate Stan Hywet Hall, a National Historic Landmark.